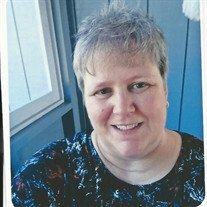 Glens Falls; Jeanne M. Mingo, 50, of Schroon Lake and Glens Falls passed away peacefully August 29, 2016 at her home. Jeanne was born June 7, 1966 in Ticonderoga, NY the daughter of John H. and Kay (Mann) Mingo. Jeanne was a graduate of Schroon Lake Central School in 1984 and attended SUNY Potsdam and SUNY Adirondack.. Jeanne worked a variety of jobs leading to her present career as a coverage specialist at Travelers Insurance Company in Glens Falls, a job that she held for over 15 years. Jeanne attended Grace Bible fellowship Church in Olmstedville, NY. Her hobbies included quilting, camping, reading, and playing cards with family and friends. She was an avid Red Sox fan and enjoyed Fenway Park. Her laughter always brought a smile to our faces. In addition to her parents Jeanne is survived by two brothers, John (Lori) Mingo of Bellville, TX, and James (Leticia) Mingo of Ticonderoga, NY, her aunt Jane Fanning and family of Lakeland Ga., a nephew Andrew Fraijo of Baltimore, MD. and a niece Francine Bassett (Harry). As well as many cousins along with the most recent addition to her family, Gunner, her adopted cat which brought much joy and happiness into her life. A funeral service will be conducted Sunday afternoon September 4, 2016 at 3:00 PM at the Edward L. Kelly Funeral Home 1019 US Rt. 9, in Schroon Lake by her pastor Rev. Chad Haneman. Interment will take place at the convenience of the family. Friends may call at the funeral home Sunday from 1:00 PM until 3:00 PM.